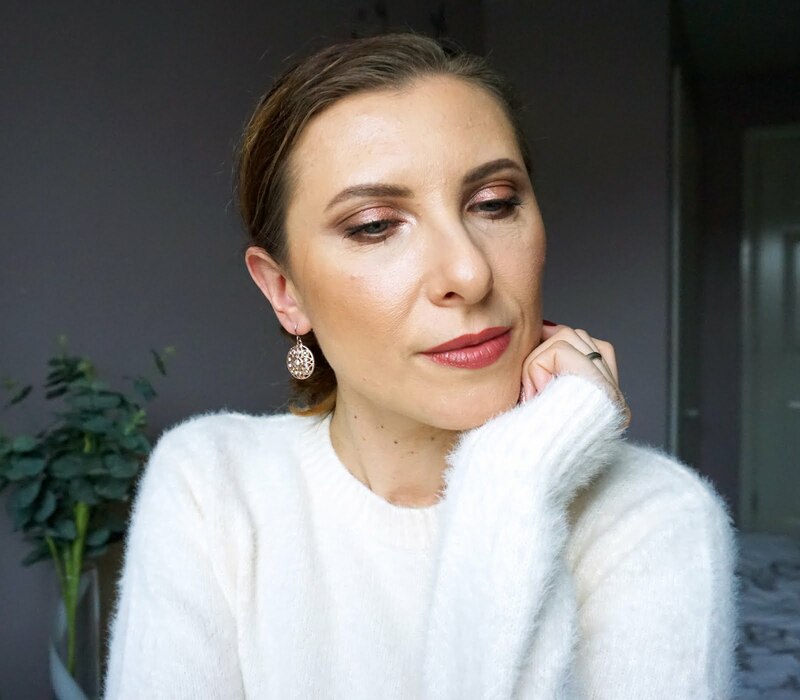 I had heard of microneedle treatments done at beauty salons in the past but never paid much attention to them as I'm, in general, not a big fan of any invasive facial treatments if they're not absolutely necessary. Having said that I am all about aging beautifully and taking best care of my skin and body so I can look my best no matter at every age. After being contacted by Swiss Clinic I made a little research on the products they were offering to send me for a review, to make sure if I'm fine with testing them out. I have found the concept of microneedle treatment quite intriguing and not as scary as it sounds so here I am, ready to share my thoughts on it. It took me a little while to warm up to the idea of rolling my face with hundreds of tiny needles but once I've conquered the fear of damaging my skin I found the whole process simple and quite relaxing really and it doesn't take much time at all which is always a plus in our already super busy lives. So what is microneedle treatment? 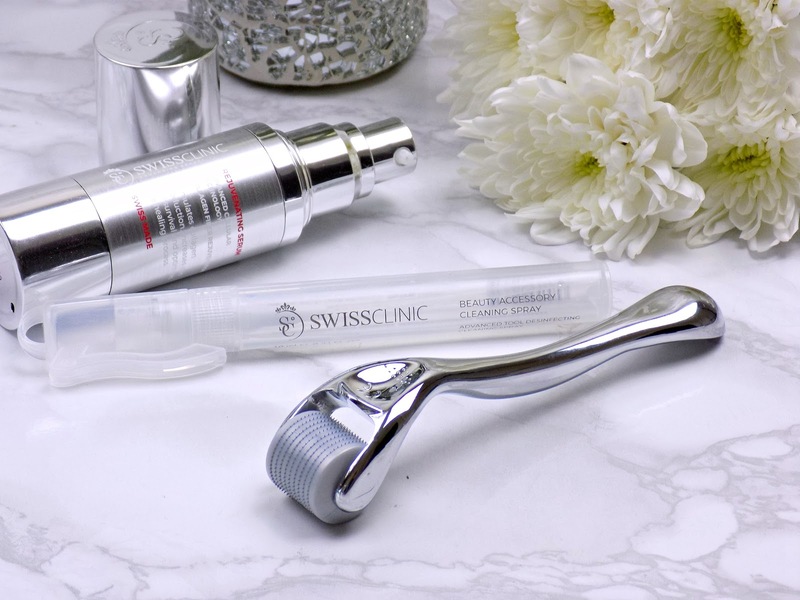 Microneedling, also known as collagen induction therapy, has been used by dermatologists for decades to treat facial scars, but recently microneedling has become more popular thanks to the availability of at-home dermarollers, or microneedling devices. Microneedling is a procedure using a device covered with tiny, shallow needles to create tiny punctures in the skin surface which cause a ‘micro injury’ and in result prompts skin to heal by stimulating collagen and elastin production which helps the skin to look plumper, lines and wrinkles less prominent, pores, scars and stretch marks less visible. Depending on the area (face, body) and the issues you want to work on you need to choose a different size of the needles in your dermaroller. Swiss Clinic offers two sizes of needles in their Skin Roller, 02mm and 0.5mm. I've been sent the 0.5mm length which is good for treating the usual signs of aging, lines and wrinkles, enlarged pores, lost firmness of the skin. Any longer needles should be used only by professionals in a beauty salon. 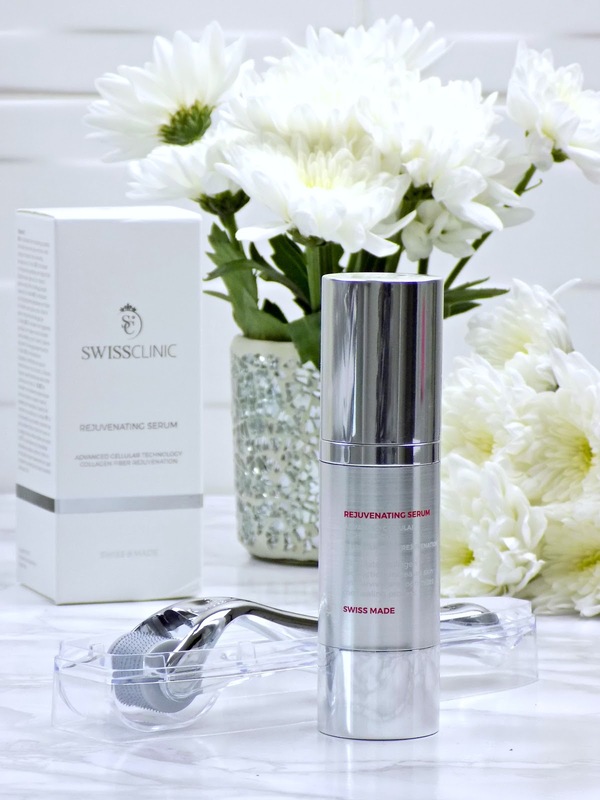 Swiss Clinic Skin Renewal System kit*, £89, consists of two products that actively work together to stimulate collagen production to minimise fine lines, wrinkles and scars, make skin firmer and smoother, improve elasticity and reduce enlarged pores. 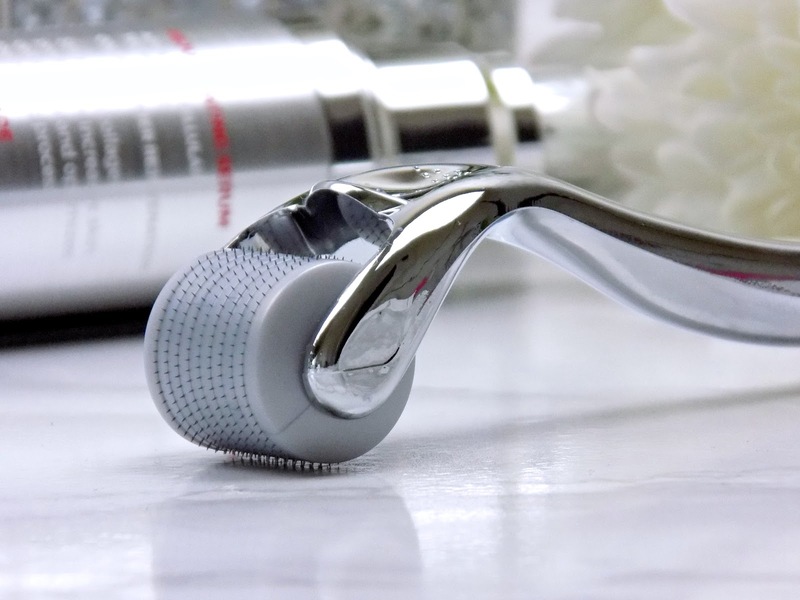 The Skin Roller has 540 micro-needles, made of Japanese surgical steel, they make small micro-channels in the skin, causing the skin to respond as if it’s been damaged. This triggers the healing process and the production of collagen. 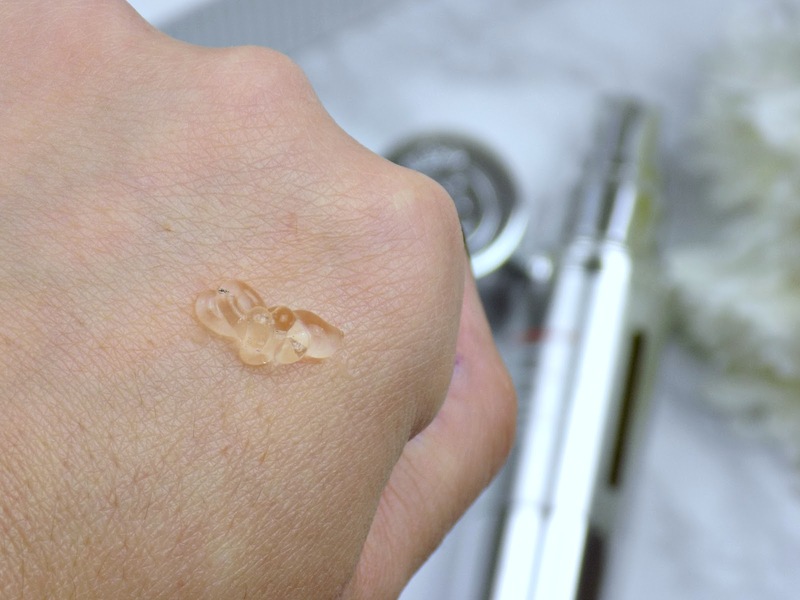 These small micro-channels also help the skin to absorb up to 300% amount of active ingredients from the subsequent skincare products than when they're applied without the roller. It's very important to keep the roller clean and sanitised so it's advised to use a sanitising spray after and before using the roller. You need to roll the skin roller, on freshly cleansed skin, in multiple directions: vertically, horizontally and diagonally, both back and forth for 2-3 minutes with straight and firm strokes to achieve optimal results. Ideally you repeat the treatment daily for 5-7 days, then allow your skin to rest for the same period of time before resuming the treatments. It is not advised to use the skin roller on active acne or very sensitive skin and stop using it if skin becomes sore or irritated. The Rejuvenating Serum is a soothing and moisturising serum with clear gel-like consistency, it contains active ingredient Beta-Glucan that stimulates skin rejuvenation and collagen production, and accelerates the skin's natural healing process. It is to be applied straight after using the Skin Roller to soothe and help to heal the skin. It gets absorbed quickly, it has no scent and it doesn't feel sticky. You can follow with some other gentle product (moisturiser, facial oil) after about an hour of applying the serum. I have done the treatment twice for 5 days in a row with 5 days break in between and now have moved to using it once a week. I'm not gonna lie the roller did frightened me a bit but, honestly, it's not as scary as it looks. First of all the treatment is not painful, yes, you'll fell the prickles and in some areas like forehead , nose, chin it feels less comfortable then on the cheeks but I've never felt like I need to stop the treatment because of a pain. Your skin will be a bit red after the treatment which is to be expected but the redness should disappear by morning. After the first two, three treatments my skin felt a little sore, even the next day, but again, nothing too alarming. After that my skin gets a bit red but the soreness subsides within few hours. Now, the most important part you're waiting for, did I get any good results? 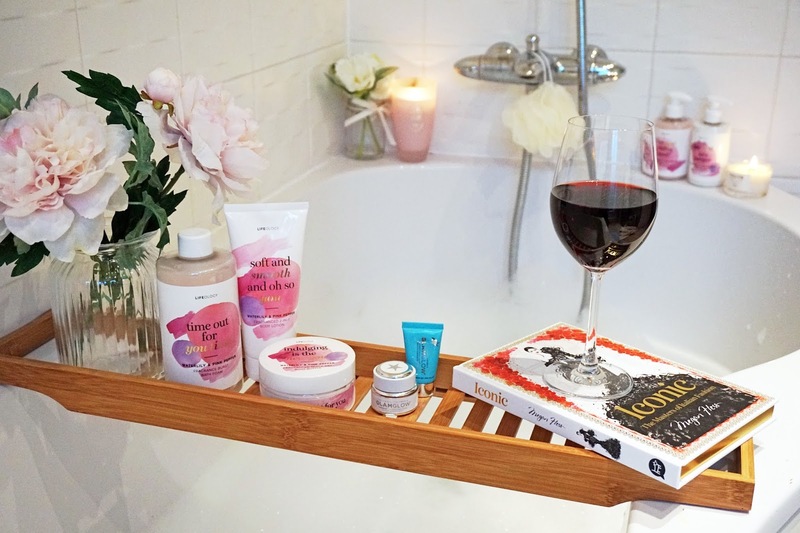 Yes, I have noticed that my skin feels smoother and plumper and my pores appears smaller which is a big plus for me as I have been struggling with large pores for most of my life. I have noticed my pores looking tighter after first few sessions so I was pretty impressed straight away. I don't have many wrinkles yet but the one, super persistent, on my forehead looks less prominent as well. Overall I think the microneedle treatment, done right, is a really effective way to a more youthful looking skin. For now I'm not thinking of doing another 5 days in a row treatment as I find it a bit invasive and even though I didn't experience anything bad with it I prefer to stick to maintaining the achieved results instead of trying to get a 'new' skin. I might repeat the 5 days on-5 days off treatment in a few months time though. Have you heard of microneedling? Have you tried it? Some of the links might be affiliated as I'm using Skimlinks on my site, check my full disclaimer for details.